Sussing out your next hair color is no easy feat. There’s a few factors that go into determining which shades will be the most flattering for your complexion. Along with your skin tone, it’s also equally important to know your complexion’s undertone. This will help narrow down which specific hair color shades will work best with your skin tone. Sounds confusing, right? It doesn’t have to be. Thanks to our comprehensive hair color guide, choosing your next shade has never been easier. We’ve broken down the best shades for every complexion with celebrity references. Keep scrolling to find out the most flattering hair color for your skin tone. Hair colorist and stylist Michael Joseph of MJ Hair Designs showing color. • People with deep skin undertones like Kerry Washington will usually have dark brown eyes. • Your skin looks healthiest in brightly hued clothing, like royal purple or green. • The darker your skin tone is, the easier you can pull off more intense colors on your lips like plums and deep burgundies. • The veins on your wrist have a purple tint. • You can pull off both silver and gold jewelry. • People with cool skin tones like Amy Adams often have eyes that are blue, gray, greenish-blue with gray flecks, or a deep brown that borders on black. • Pink or blue-based red lipsticks are more flattering than corals, terracotta reds, and chocolate browns. • The veins on your wrist have a blue tint. • Silver jewelry looks best on you. • Warm skin tones like Jennifer Lopez‘s are usually accompanied by green, hazel, amber, or warm brown eyes. • Coral, terracotta red, and chocolate brown lipsticks are more flattering than pinks or blue-based reds. • The veins on your wrist have a greenish tint. • Gold jewelry looks best on you. “The lighter your skin tone, the paler you can go with your hair,” says celebrity colorist Rita Hazan, who works with Beyoncé and Jessica Simpson. Fair complexions with warm undertones like Elizabeth Olsen’s look best against hues of butterscotch, strawberry blonde, and honey. These shades play up the peachiness of your skin and cast a soft glow on your face. If you have a cool undertone like Julianne Hough, look for blue-based colors like platinum, flaxen, and champagne blonde to flatter your ivory complexion. Most blonde tones start to fade two weeks after they’ve been applied, says celebrity colorist Marie Robinson, who works with Scarlett Johansson. To keep your hue as vibrant as possible, use a shampoo that’s formulated with purple pigment like Sachajuan’s Silver Shampoo to counteract any brassy tones. Not only can this versatile complexion carry a wide spectrum of shades, but it also provides a beautiful backdrop for high-contrast highlights. People with cool undertones like Cameron Diaz should stick to ashy tones like sand, wheat blonde, or walnut brown to counteract any hint of redness in your complexion. Tawny blonde, golden caramel, or copper pick up the buttery tones and prevent sallowness in warm undertones like Mandy Moore’s. The lighter you go, the more prone your hair is to brassiness, says New York City colorist Sharon Dorram. Lather up with Aveda’s Color Conserve Shampoo. The plant-based formula cleanses hair while keeping your tone intact. Also invest in a shower-head filter to remove mineral buildup, which can alter your color. This skin tone can stand up to the intensity of a deep, rich brown, or an earthy color. “Add some strategically placed highlights in a subtle gold or honey if you want to create depth,” suggests Robinson. To balance greenish tints in complexions with cool undertones like Alexa Chung’s, try toasty hues like chestnut brown, auburn, and cinnamon. Ebony brown, mocha, and violet-based colors will enhance the natural warm undertones of complexions like Shay Mitchell’s. Any amount of styling damage can make brown hair look dry and drab, so seal in plenty of moisture with a weekly color-preserving, strand-repairing mask like Bumble and bumble’s While You Sleep Overnight Damage Repair Masque. It nourishes and mends damage from coloring and heat-styling. The whole idea here is to create contrast between your hair and your complexion-whether that means going lighter or darker, explains Dorram. “If your hair color is too close to your skin tone, your features will disappear.” Deep, dark tones of espresso and inky black look striking next to blue-based complexions like Lupita Nyong’o’s. If you have a warm undertone like Beyoncé’s, opt for maple brown, mahogany, toffee, and other rich, warm colors to bring out the apricot tones in your skin. 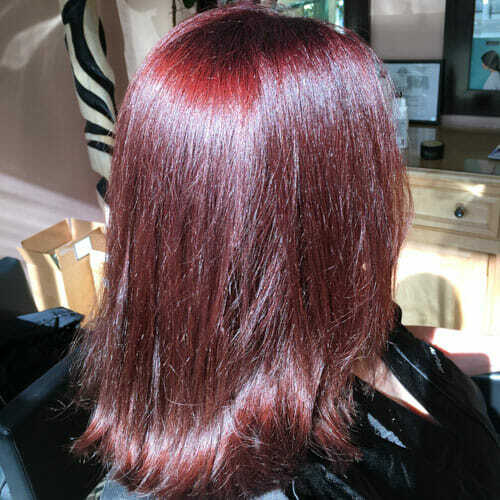 Darker strands look best when they reflect light, says Los Angeles hairstylist Kimberly Kimble. Stick with products that are free of sulfates, detergents can strip hair of its natural oil. Kimble recommends a treatment like L’Oreal Paris’s EverCreme Sulfate Free Nourishing Butter.